With contortion I learned to love what I can actually do with my body. Sofia Venanzetti is a certified personal trainer, certified pole dance instructor, flexibility coach and contortionist from Milan, Italy. She moved to Miami, FL in 2006 to expand her knowledge in fitness and bodybuilding, her biggest passion at that time. She competed in several Fitness and Figure competitions in California, Florida and Italy. She also worked for fitness magazines like Oxygen (2011). In 2012 she started teaching pole dance, floorwork and flexibility at Pole Fitness Studio in Las Vegas. The same year, she also started contortion training under the guidance of Mongolian top contortionist Otgo Waller. Sofia currently lives in Las Vegas, NV. 1. Sofia could you please tell me your story. How did you come to contortion? How long are you doing contortion? 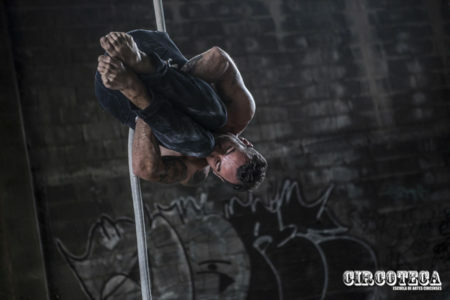 I started contortion to improve my tricks on the pole. At first I didn’t even consider becoming a contortionist, I just wanted to add more flexibilityto my moves, but shortly after I fell in love with contortion and its challenges. I’ve been doing contortion for 3 years and a half. 2. How has contortion changed your lifestyle? Contortion has changed me a lot. Being into fitness and competing in my past years, I’ve always put a lot of importance on aesthetics and appearance, I was dieting all the times to look my best and I was very strict. With contortion I learned to love not just how I look, but what I can actually do with my body. I’ve gained a lot of freedom, especially with my approach to food. I became flexible also in my mentality 🙂 I’m way healthier now that I’ve ever been, and contortion is a big part of it. 3. Does training influence your meals habits? What do you usually eat? I try to eat mostly vegetables, healthy grains like oats, quinoa, brown rice, fish, avocado and nuts. These food I know keeps me light and sharp with my training. But I’m human, and I like bread and pizza a lot (plus I’m Italian! ), but I try to eat the less healthy and more starchy food sporadically. I don’t eat a lot of meat or cheese. I find those food heavy to digest and not the best for training. I drink plenty of water, tea and coffee! That keeps my energy always going. I take a strong joint supplement, which is very important for people who stretch often. The one I take has the best ingredient and highest quality on the market, I’ve taken it for years. 4. How long do you stretch every day? What time of the day do you like to stretch most? I like to stretch midday. Never too early in the morning, because the body takes a few hours to wake up and loosen up from sleep’ stiffness. I train about 2- 3 h, 5 times a week. 5. I know that many people are impatient when stretching and want to get the results right away. What tips against injuries can you give to the readers? Were you once overstretched or injured? How did you cure it? Did you have to stop training or could you train with injury? Do you know some good muscle lotion that one could buy online? Warming up is the best way to avoid injuries. Actually most of my training involves warming up! I warm up from 30min to an hour before I try more difficult exercises. I got injured few times: my right shoulder, my left hip and right low back. Unfortunately injuries happen to anyone … Especially to those who train often. When it’s just a strain (a muscle tear) rest and ice/heat makes it heal. But when it’s an injury to tendon or ligament or even disc, it’s another story… Those areas don’t get any blood circulation so they heal slowly and sometimes never fully. So after a first time of total rest, training has to be done with a lot of attention and care to not make things worse, so less intensity, less range of motion, and avoid what in first place caused the injury (wrong exercises or moves). 6. Do you use a back warmer? When one should use a back warmer, is it the whole day or just before and during the stretching? Will one get the same results with a good warm up and without the back warmer? I use a back warmer because it provides warmth and support to the low back, which is at greatest risk of injury when back bending ( low back has two functions, bending and supporting the torso, so it works a lot!). I can’t tell you if I would be the same flexible without it… It just gives me more security and comfort 🙂 I wear a back warmer only when I train, then I take it off. Here‘s more info about back warmers! One of my favorite intermediate/advanced stretches for middle split is from frog pose, open one leg straight to the side, placing the foot on top of a block. The most effective stretch for front hips is … The lunge! Really there is nothing better, and offers many variations of difficulty. A tip for pigeon pose backbend is: warm up very well low back and hip flexor of the leg extended, warm up gluteus of the front leg bent. This way the starting position will feel more solid and comfortable so when you start bending back you won’t fall sideways. 8. How often do you do pole dance and how often contortion? The most pole dance I do is actually when I perform (at venues or events here in Las Vegas) so in theory I don’t train pole anymore beside sometimes if I want to review a trick or a transition. I train contortion 5 times a week and that includes all flexibility, strength and balancing training. My favorite pole dance move is jade: it’s simple but a real crowd pleaser. My favorite contortion move is probably crocodile and zigzag cheststand 🙂 right now I’m working to improve my handstands, being so tall (5 11, 179cm) makes balancing my biggest challenge! 9. How long time does it take you to prepare a performance? What is the most important for a contortion performance from your point of view? 10. What or who is your biggest motivation in contortion? 11. I know that you give classes via Skype. How does it work and where one can book classes with you? I use Powhow platform to track classes and payments, but for the actual lesson I meet my students on Skype. So once the student is registered on Powhow and logged in their class, we train on Skype. Skype seems to have the best connection worldwide. My classes are all privates because I feel students need a lot of individual help to progress, that’s also how I improved faster: with individual attention. I also offer video tutorials on my Powhow page, you’re welcome to check them out! Las Vegas based contortion and pole instructor and performer.